Flexible, reliable and placing you in control. Lavalife.com is a dating site which offers a unique approach. Instead of joining a general pool of daters, who may well be looking for different things, you will have the choice to upload your profile to any of three categories – Casual dating, relationships or intimate encounters. Whichever option you choose, you can be guaranteed innovative features, such as the “party” video chat which takes place 5 times each day. The overall concept where you choose what type of dating service you want is unique and difficult to find elsewhere. You can upload your profile to more than 1 of the 3 categories – Casual dating, relationships and intimate encounters. Unlike other dating sites, not only does this streamline the matching process, but it takes into account your shifting dating requirements. Once you decide the kind of date you want, there are plenty of options to contact other users. These include private message, instant message and sending a “smile.” It is estimated that more than one million messages are exchanged daily. In addition though, the “Call Me” feature allows you to phone other singles without disclosing your number, while the “Mobile” tool does the same for SMS chat. There is also an emphasis on interaction and so not only are there active chat rooms, but the “Party” is a 5-times daily video chat with other singles. Meanwhile, make sure you don’t miss out on the daily online speed dating for locals in your area. The Lavalife sign up is extremely simple. You will initially be required to submit some basic information such as name, gender, date of birth, e-mail address and password. Another screen will prompt you for a username, location and further details such as height, body type, ethnicity and religion. On a third screen, you will be asked what kind of relationship you are looking for, plus your smoking and drinking habits and your rough income. Finally, you will be asked to upload a profile picture. Everything is operated via simple drop-down boxes and so the process should take just a few short minutes. On Lavalife.com, the mandatory profile picture acts as an excellent guard against potential scammers. Meanwhile, if you do find another user suspicious, then you can simply block them from contacting you again. 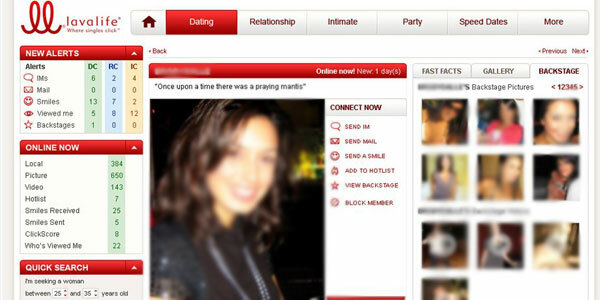 There is also a page of valuable safety tips for dating online, which is well worth reviewing. Free members on Lavalife.com enjoy somewhat more functionality than at many other websites. They can send “smiles” and respond to private messages sent by paid members. However, free members cannot really initiate contact and so if someone catches your eye, it is worth becoming a paid member. The cost for a single month is $19.99, but a 3-month deal is available for $16.99 monthly. Meanwhile, a 6-month package will cost you just $9.99 each month. This is an incredibly simple site to use. The design is eye-catching yet straightforward to use and you will find yourself just a click away from all the essentials, including your inbox, the search function and your personal settings. In addition, there are plenty of novel aspects to the site which simplify the user experience. For example, you can see when a member last changed their profile or was last online, helping identify the regular users. You can also organize all the profiles which you like into one “hotlist.” And the “news alert” keeps you updated on your interactions with other users. There is also the option to sign up via Facebook, which may be more straightforward for you. There is also a mobile app, which includes exclusive features such as the Lava Lounge, where you can interact with other members on the go. The search function at Lavalife.com is both easy to use and effective. Again, personal control is of utmost importance. So, you can opt to conduct a basic search, which allows you to find someone based on general criteria such as age and location. Or, you can use an advanced search, which provides an impressive range of search categories to pinpoint the person you are looking for, including physical features and lifestyle. In addition, the “In Common” feature is a useful way to find out exactly how compatible you might be with another user, as it hones in on the reasons why you might make a good match. 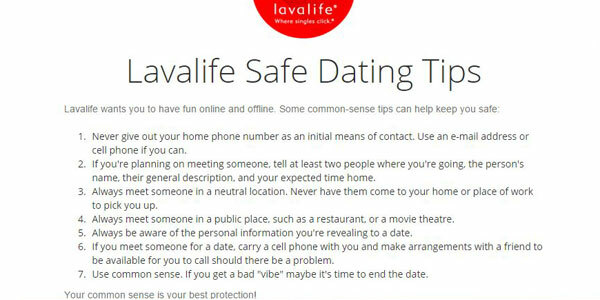 Lavalife.com is a top-class general dating site with a difference. It allows you to choose the exact kind of dating experience you want. Lavalife also offers special platforms for over-45 daters with “Lavalife Prime,” gay singles can access “ManLine” and lesbian singles can enjoy “WomanLine”. However, if Lavalife doesn’t suit your dating needs, read our review of Zoosk.com. Although, whichever category you choose at Lavalife, you can be sure of an engaging range of features, an attractive interface and an all-round fun experience.